School is out and summer is upon us! The past few weeks have been very busy, especially with finals and packing. I learned earlier this week that I am moving to Arizona in mid-July! It will be hot down there, but I’m sure we’ll love it. Lacrosse is more popular down there as well! 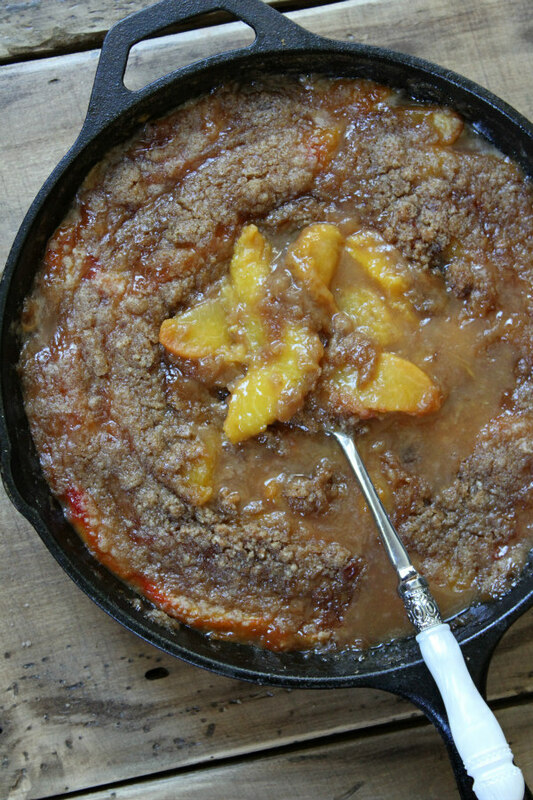 This week I made Georgia Peach Crisp. I was finally able to find time for cooking this week and the results were phenomenal! Nothing can beat fresh peaches in summer. 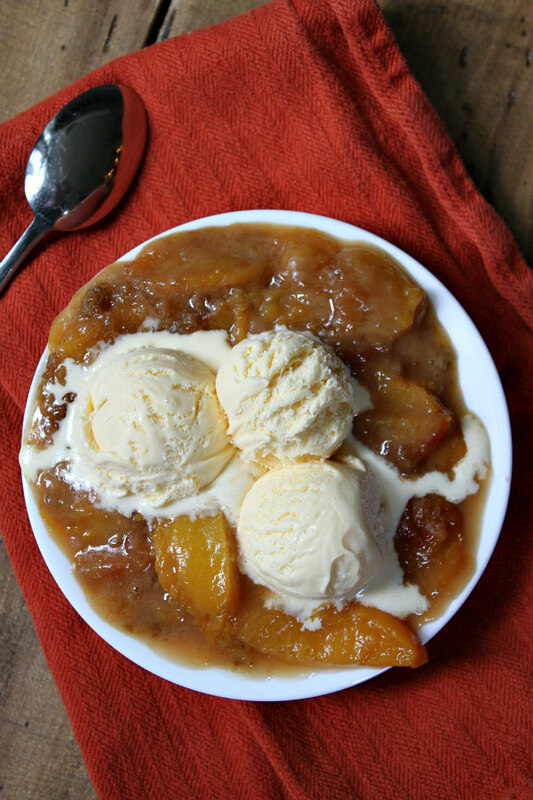 Warm peaches and frosty ice cream… Perfect! Traditional crisp includes pecans in the topping, but my family isn’t crazy about nuts so I chose to exclude them in this recipe. I think that decision was for the best! 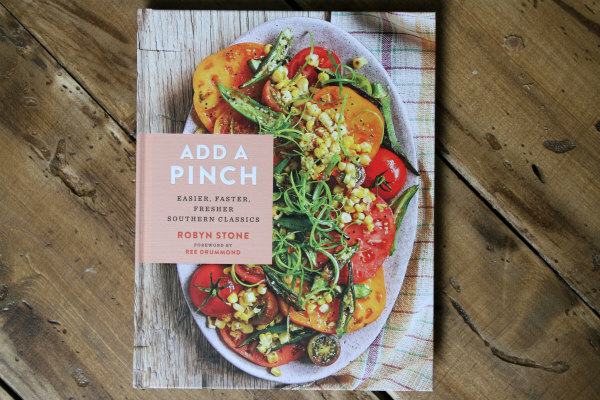 The recipe comes from a new cookbook by my Mom’s good friend Robyn Stone: Add a Pinch- Easier, Faster, Fresher Southern Classics. It’s full of all kinds of delicious recipes that the southern region of the US has to offer. 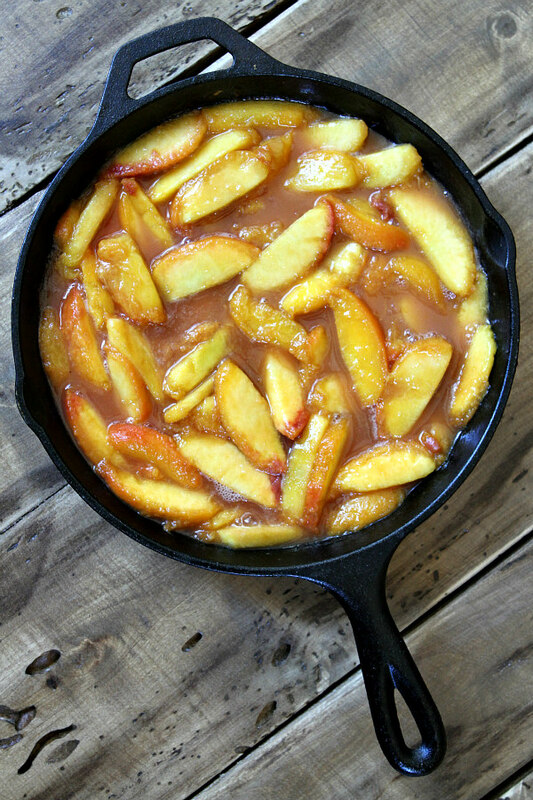 I used insanely juicy peaches in this recipe… In hindsight, I would recommend using more firm peaches to improve the consistency of the crisp. Although it is basically a sugar and butter mixture, I loved nibbling on the topping. I’d also recommend increasing the amount of topping used (but not by much). This would make the dish a bit more crispy than the way mine turned out. That’s a pretty sight! 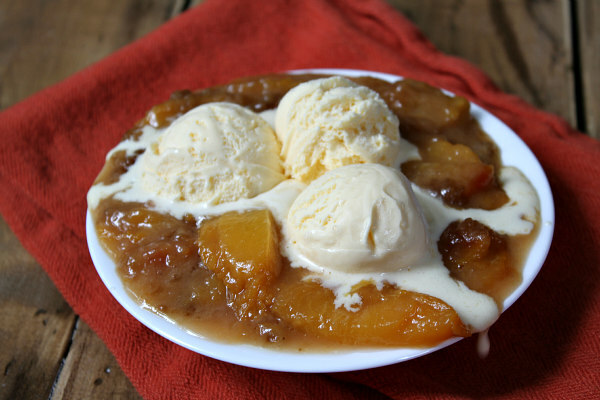 The topping baked perfectly over the peaches and formed a work of art. I am very impressed with how this recipe turned out. It is picture perfect! 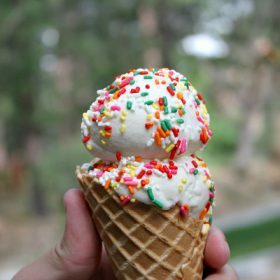 My family LOVED this dessert… In fact, I made this for dessert on Father’s Day. We ended up devouring the entire crisp! I even made a gluten-free version for my grandma to eat. 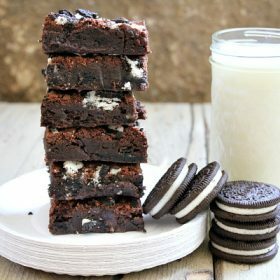 Everyone thought this simple recipe tasted fantastic. I would highly recommend this crisp for its ease and simplicity. It doesn’t have to take hours in the kitchen to achieve great flavor. Instead, it’s all about the ingredients used and how they blend together into a flavorful masterpiece. 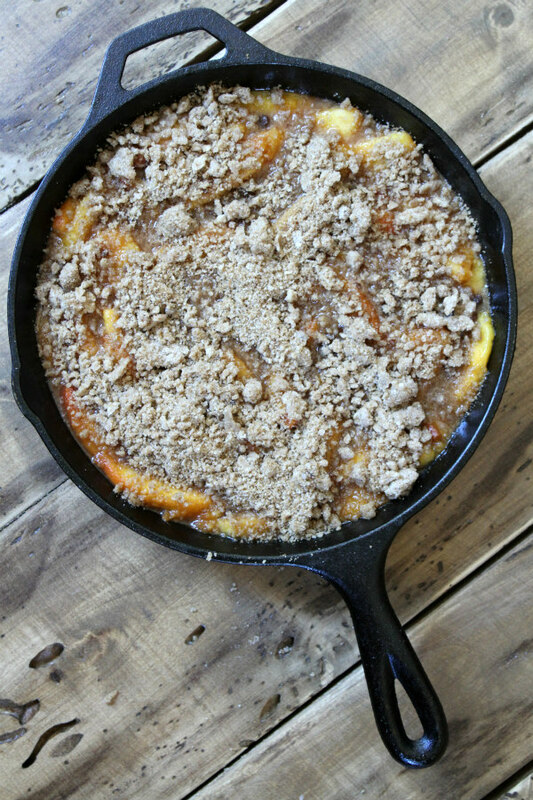 And that is exactly what this Georgia Peach Crisp is!! Preheat the oven to 350 degrees F. Line a rimmed baking sheet with foil (to catch anything that might bubble over). In a 12-inch ovenproof skillet set over medium heat, melt 1 tablespoon of the butter. Add the peaches and 1/4 cup of the brown sugar. Cook, stirring, until the juices thicken into a light syrup- about 8 minutes. Remove the pan from the heat. In a medium bowl, combine the remaining 4 tablespoons of butter, the remaining 1/2 cup brown sugar, flour, pecans and salt. Spread the mixture over the peaches. Place the skillet on the lined baking sheet. Bake until golden brown and bubbly, about 30 minutes. Serve warm. 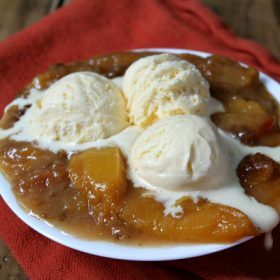 The Georgia Peach Crisp is gorgeous, Brooks! I’m so glad you and your family enjoyed it!!! Thanks so much for sharing this favorite recipe from my cookbook! I hope you find many more recipes in the cookbook that you enjoy as much as my family does! Best of luck to you with your move to Arizona! Looks delicious, Brooks. Wish I’d been there to enjoy it with you guys!